Sincerity - Description | W. W. Norton & Company Ltd.
What do John Calvin, Sarah Palin, Jean-Jacques Rosseau, and Bon Iver have in common? A preoccupation with sincerity. 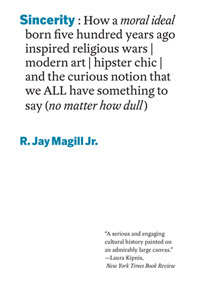 With deep historical perspective and a brilliant contemporary spin, R. Jay Magill Jr. tells the beguiling tale of sincerity’s theological past, its current emotional resonance, and the deep impact it has had on the Western soul. At a time when politicians are scrutinized less for the truth of what they say than for how much they really mean it, Sincerity provides a wide-ranging examination of a moral ideal that remains a strange magnetic north in our secular moral compass.